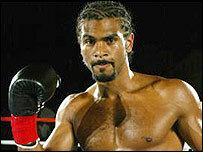 British cruiserweight David Haye will take on IBO champion Carl Thompson at Wembley Arena on 10 September. The promising 23-year-old, tipped as a dominant force in the division in years to come, will pit his power against the experience of 40-year-old Thompson. If Haye wins, he looks set to challenge for British and Commonwealth glory and may perhaps even meet Welsh WBU holder Enzo Maccarinelli. Haye has won his first 10 professional fights in a total of only 20 rounds.